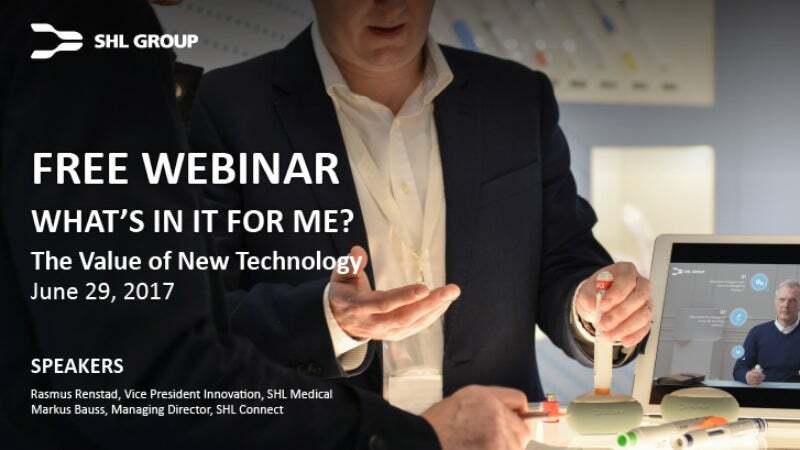 SHL Group has announced that it will be holding a webinar discussing the value of new technologies in digital health and drug delivery systems. The talk will be co-presented by SHL’s vice-president for innovation Rasmus Renstad and SHL Connect’s managing director Markus Bauss. With smart, connected objects becoming so widespread in every aspect of life and the Internet of Things (IoT) becoming an increasingly prevalent phenomenon, the question of their inherent value is often left out. In the area of drug delivery, it is particularly important to remember that the ultimate gatekeeper of any innovation is the patient, and that all designs must be centered around making the patient’s life as healthy and comfortable as possible. Rasmus Renstad is vice-president for innovation at SHL Medical, a privately-owned designer, developer, and manufacturer of advanced drug delivery devices such as auto injectors and pen injectors. Rasmus has almost 20 years’ experience in technical and business management. For the last 12 years, he has been working for SHL specialising in product development and design engineering for medical devices. Rasmus holds a Ph.D. in Polymer Technology from KTH Royal Institute of Technology and a B.Sc. in Business Administration and Economics from Stockholm University. Markus has more than ten years’ experience working within a number of leading roles in the pharmaceutical packaging industry. An innovator and entrepreneur, Markus launched the technology startup ConnectMeSmart in 2013 to look into new technologies for smart phones, mobile apps, and connectivity. The startup paired with SHL in 2015 in joint venture SHL Connect to investigate the emerging connectivity market and explore the application of new technologies with SHL’s drug delivery solutions. Markus graduated from Clausthal University of Technology with a degree in Process Engineering and Chemical Engineering.